Bruce Mau is a renowned designer, known for his rebranding of various popular companies, including Sonos, TRX, and The Weather Channel. [i] Mau founded the Institute without Boundaries, an academic program that aims to utilize design to correct social, economic, and environmental issues. [ii] His work for the Institute without Boundaries is relayed in his installation at the Philadelphia Museum of Art. [iii] The exhibit reflects the Institute Without Boundaries’ mission to universalize creativity and design to implement change with its wide array of pieces that imply a necessity for reform. The juxtaposition of stark white with a vivid array of colors entices the viewer into the exhibit. A wall coated in Mau’s book cover designs stands parallel to a wall featuring information about the Institute without Boundaries. 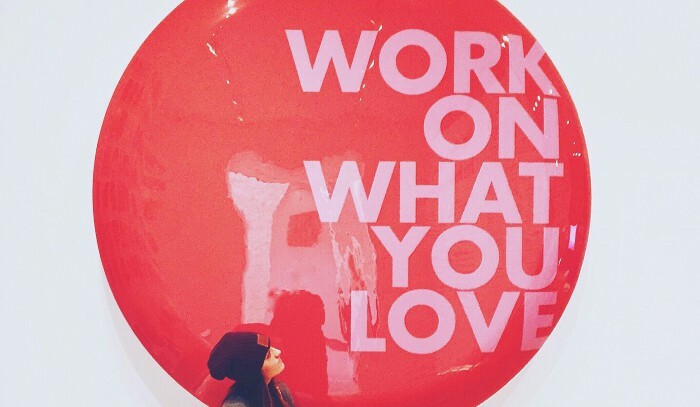 The two walls funnel viewers towards the cynosure of the entry space: an oversized red button emblazoned with the exhibit’s namesake mantra, “Work on What You Love,” in hot pink font. Similar buttons of varying sizes and colors are scattered throughout the exhibit, each exclaiming unique, motivating mottos: “Design Your Own Economy;” “Think Like You Are Lost In the Forest;” “Compete with Beauty;” along with many others. The vivacity of the display’s colors, in conjunction with the zealous phrases, instantly uplifts the viewer. The buttons guide the viewer through the exhibit, engendering certain emotions such as awe and ambition. Throughout the display, different design pieces compete for attention, inducing the viewers’ excitement. The buttons add a sense of order and cohesiveness to the strategic mess of vivid colors. The buttons act as a medium for Mau to explicitly express his sentiments. As one ingests the energetic design elements, the buttons’ wisdom seeps into the museumgoer’s mind. While the exhibit seems to merely be a sampling of Bruce Mau’s extensive design work and a snapshot of his attempts to redesign society, the exhibit is more of a personal revelation. As one takes confident steps through the exhibit, one realizes the power of design—the power on an individual and on a society alike—and realizes that everyone possesses the power to design… Or at least Bruce Mau tries to convince his viewers of that assertion. Exiting the exhibit, even the self-proclaimed artistically inept are inspired to go out into the world and create—and “Design What You Do to Tell Your Story,” as Mau demands in yellow and silver on one of his many buttons. Re-entering the minimalistic hallway of the Perelman Building, museumgoers envision the designs they could splay across the walls; across their lives. [i] “Bruce Mau: Work.” Bruce Mau Design. Bruce Mau Design, n.d. Web. 7 Mar. 2016. <http://www.brucemaudesign.com/work&gt;. [ii] “About Us.” Institute Without Boundaries. N.p., n.d. Web. 7 Mar. 2016. <http://institutewithoutboundaries.ca/about-us/overview/&gt;. [iii] “Work on What You Love: Bruce Mau Rethinking Design.” Philadelphia Museum of Art. N.p., n.d. Web. 7 Mar. 2016. <http://www.philamuseum.org/exhibitions/830.html&gt;.